From July 1999: the first issue of Titan's STAR WARS COMIC, a reprint vehicle (beginning inevitably with the adaptation of THE PHANTOM MENACE) for the myriad of US Dark Horse strips. The first issue stayed on sale for a fortnight which allowed Titan to cover flash the second issue as "the first weekly issue"... unobservent collectors take note as I've seen at least one dealer trying to sell it as issue one! 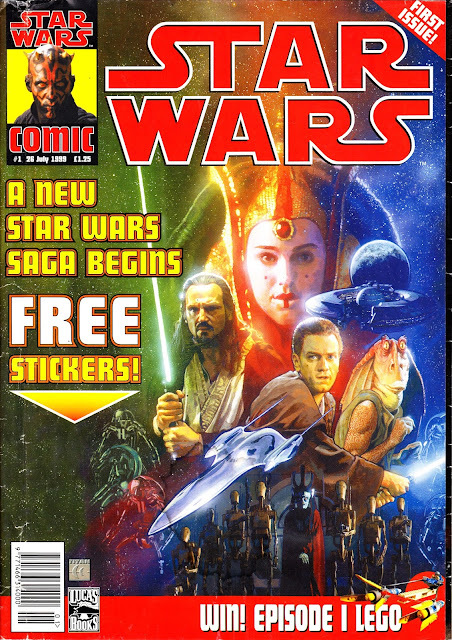 This was a bit of a landmark as it was the first time that a regular WARS comic had appeared in the UK since the ill-fated Dark Horse International monthly at the beginning of the decade. Titan had, however, already been publishing the magazine (which initially featured some comics reprints) for several years. I didn't follow the fortunes of the comic after this because the film was such a crushing disapointment (I was however surprised to find that I had some copies in storage which I must have acquired at some point) but I am aware there's been numerous reboots and relaunches over the next seventeen-odd years, usually coinciding with the next development in the screen life of the franchise.